NFL Commissioner Roger Goodell speaks on the opening day of Levi’s Stadium in July in Santa Clara, California. NFL Commissioner Roger Goodell is under pressure to resign for his handling of Ray Rice, the former Baltimore Ravens running back who knocked out his then-fiancee in a casino elevator in March. Rice was initially suspended for two games, in line with the NFL’s history of issuing shorter suspensions for domestic violence than for many other types of personal conduct violations — even though rates of domestic violence arrests are high among NFL players as compared with other crimes. Goodell announced changes to the league’s policy in August, introducing six-week suspensions for first-time domestic violence offenses and lifetime bans for repeat offenders. But the new policies were not applied retroactively to players like Rice. Goodell came under renewed criticism this week after additional video of the casino incident was published by TMZ; it shows Janay Rice collapsing after the running back punched her. Ray Rice has since been released by the Ravens and suspended indefinitely by the NFL, but a number of reports have called into question Goodell’s claim that he had not seen the longer video at the time he decided on Rice’s initial two-game suspension. Goodell has so much goodwill in the bank in [the owners’] eyes that there’s no way—without definitive proof that the commissioner lied—they’d throw him, and his $44 million annual compensation, to the wolves. The goodwill includes a collective bargaining agreement with the players association through 2020 and lucrative TV contracts that pay each team about $150 million per year. The NFL wasn’t always quite so dominant, especially relative to baseball. In 1991, when Financial World magazine issued valuations for the four major North American sports leagues (see Rodney Fort’s website for archived data), NFL franchises were worth an aggregate $6.5 billion (adjusted for inflation to 2014 dollars), not much more than the $5.5 billion for MLB teams. 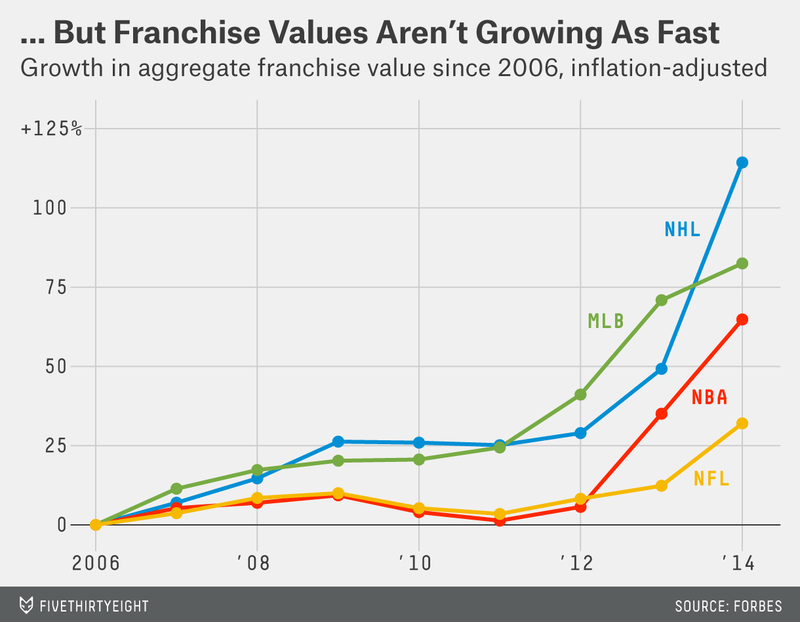 But NFL franchises have appreciated at an annual rate of 8.8 percent since then, compared to baseball’s 6.7 percent. The bulk of that growth, however, occurred under Goodell’s predecessor, Paul Tagliabue. Since Goodell took over as commissioner in 2006, NFL franchises have risen in value by 32 percent, net of inflation, according to Forbes. That’s the lowest of the North American leagues by some margin. 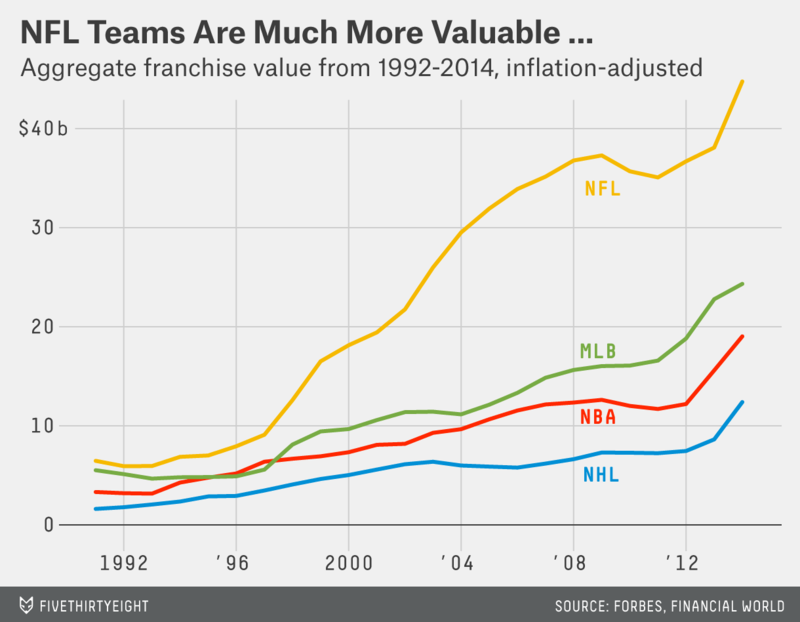 NHL franchises have increased in value by 114 percent, MLB franchises by 82 percent and NBA franchises by 65 percent over the same period (and Forbes is probably undervaluing the NBA, given recent franchise sale prices). Broken down in terms of annual growth rates: NFL franchise values grew at an annualized rate of 11.7 percent from 1991 to 2006 under Tagliabue and just 3.5 percent per year since 2006 under Goodell. The Forbes estimates aren’t perfect. All NFL franchises but the Green Bay Packers are privately held, and the league has very low rates of franchise turnover, with many teams having remained in the hands of the same family for decades. But the prices of recent franchise sales, like those of the Jacksonville Jaguars and Cleveland Browns, have closely matched the Forbes valuations. The modest rate of franchise value growth under Goodell has come from a very high baseline — and perhaps some decline in the rate of growth was inevitable given how prodigiously they grew under Tagliabue. In absolute dollar terms — not percentages — NFL franchise values have risen by a collective $10.9 billion since 2006, compared with $11 billion for baseball, $7.5 billion for the NBA and $6.6 billion for the NHL. The NFL is still a hugely profitable business, and even poorly run franchises tend to make money because of the league’s aggressive revenue sharing and relatively favorable contractual agreements with players. According to Forbes, only the Detroit Lions lost money in 2013, and the league’s 32 franchises earned a collective $1.7 billion in operating income. At the same time, the NFL did such a good job of expanding its reach and protecting its brand under Tagliabue and Pete Rozelle that even a mediocre commissioner could be in a position to look good. Compared to his predecessors and his counterparts in other leagues, Goodell’s value to the NFL’s bottom line hasn’t been quite so clear.